This NASA graphic shows the location of Saturn, the moon and Mars amid three constellations in the southwestern night sky one hour after sunset on June 6, 2014. Stargazers have a chance to see the five brightest planets in the night sky, weather permitting, as they make appearances in the evening or as predawn spectacles. And on occasion, the moon will pass by to enhance the celestial view. One of the five visible planets in June — Mercury — very quickly departs the evening sky early in the first few days of June as it makes the transition from an evening to a morning object. The planets worth seeing are Jupiter, Saturn, Venus and Mars, and all are shining bright this month. June 1 — Mercury at night: After serving as an excellent evening apparition during May, Mercury appeared very low near the west-northwest horizon about an hour after sunset on this night. The tiny, rocky world shined at magnitude +1.4, but as it approaches the vicinity of the sun and its disk wanes to a thinning crescent, it will fade rapidly into the sunset glow. Jupiter and elusive Mercury can be seen low in the west-northwest sky just after sunset in early June 2014, as shown in this NASA sky map. June 7 — Mars and the moon: As darkness falls this evening, look toward the south-southwest part of the sky to see the waxing gibbous moon with Mars, shining with a fiery yellow-orange glow hovering about 3 degrees above it. Mars currently shines at a brilliant magnitude of -0.4. And yet, this is 2.5 times fainter than it appeared last April when it was at opposition and closest to the Earth for 2014. As it continues to recede from us, Mars will continue to slowly diminish in brightness in the night sky. Currently, it's 77.9 million miles (125.3 million kilometers) away. 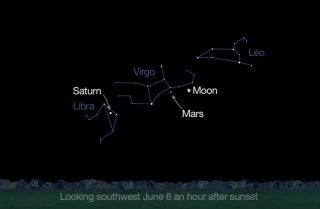 June 10 — Saturn and the moon: The ringed planet and the full moon will be evident about an hour after sunset in the south-southeast part of the sky. Saturn will be the very bright yellowish-white "star" shining about 5 degrees to the moon's upper right. Saturn's fabulous ringsare currently tilted about 21 degrees to our line of sight. The moon, ringed planet Saturn and constellation Scorpius offer a dazzling night sky target on June 10-11, 2014 in this NASA graphic. June 19 — Mercury: The rocky planet arrives at inferior conjunction, passing between the sun and the Earth and enters the morning sky. June 24 — Venus and the Pleiades: A very pretty scene awaits early risers who are up about 60 to 90 minutes before sunrise. Look low toward the east-northeast horizon for a view of a very thin waning crescent moon, just three days before new phase. Situated about 3 degrees above and to the left of this slender lunar sliver is dazzling Venus. If you have binoculars and look early enough, while the sky is still relatively dark, scan about 10 degrees above Venus for a view of the famous Pleiades star cluster, now just beginning to emerge back into view after having been hidden in the glare of the sun for the past month. June 28 — Jupiter and the moon: About an hour after sunset, look low toward the west-northwest horizon to glimpse a hairline crescent moon only about 30 hours past new phase. Hovering about 5 degrees directly above the moon will be Jupiter, getting ready to relinquish its six-month run as the most prominent evening planet. Binoculars will certainly help. Jupiterwill vanish into the evening twilight during early July as it transitions from the evening to the morning sky on July 24. Editor's note: If you snap amazing photo of the planets, or any other night sky view, and you'd like to share it for a possible story or image gallery, please contact managing editor Tariq Malik at spacephotos@space.com.